This workshop is supported by the National Science Foundation, the University of Minnesota School of Mathematics, and the IMA. Harmonic Analysis and the theory of Elliptic Partial Differential Equations are well-established areas of mathematics with a long celebrated history. Over the years they influenced the development of many other fields: Number Theory, Probability, Combinatorics, Geometry, linear and non-linear PDEs, to name just a few. Just as significant is their impact in life sciences, physics, engineering, computer science. The Workshop will concentrate on central developments of modern Harmonic Analysis and Elliptic PDEs. It will introduce participants to methods and techniques which have emerged in recent years and yielded some of most influential results. We shall further discuss important open problems, current progress, and main challenges. Some of the focal points include: the theory of weights, dyadic harmonic analysis, singular integral operators, Haar shifts and Bellman function, Carleson measures and their role in Analysis and PDEs, elliptic PDEs on non-smooth domains, multilinear Fourier Analysis, as well as connections to geometric measure theory, additive combinatorics, analytic number theory, several complex variables. The Workshop for Women in Analysis and PDE is targeted towards women at the early stages of their career in mathematics. It is designed to support them through the crucial passage from the graduate school to postdoc to faculty position to tenure, which is statistically the phase at which a particularly high percent of women leave academia. It is a focused educational and research program in a chosen area of Analysis and PDE, which will bring together outstanding senior female mathematicians and junior researchers. The Workshop is centered at two series of Main Lectures, contains invited and contributed talks, as well as panel discussions regarding career development issues. General goals of the Workshop: what will YOU get out of it? Despite numerous initiatives and undeniable progress over the past few decades, gender imbalance in mathematics remains significant, with a pronounced drop-off at the turning points of the career: while 42% of undergraduate degrees and 31% of Ph.D.s in math are awarded to women, one finds only 19% of female postdocs and 12% of women among the tenure-track and tenured faculty at doctoral departments. While today’s market in research mathematics is extremely challenging in principle, it is particularly difficult for women, for a variety of professional and personal reasons: some remaining bias, little visibility in the field, and a side but quite often crucial consideration: the reality of having to handle decisive points of career and personal life at the same age. 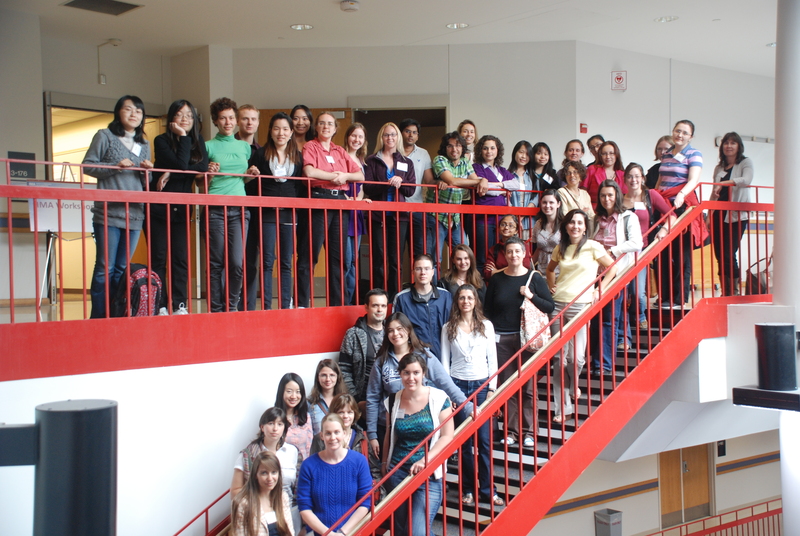 The Workshop for Women in Analysis and PDE is targeted towards women at the early stages of their career in mathematics, emphatically supporting them through the crucial passage from the graduate school to postdoc to faculty position to tenure, which is statistically the phase at which a particularly high percent of women leave academia. We aim to make mathematics equally open to everyone, and all interested researchers are invited to apply, regardless of affliation, age, and gender. Some travel funding is available due to the support of the National Science Foundation. and the panel discussion "Career in Mathematics." 4:00 pm - 4:30 pm Muckenhoupt and Reverse Holder classes of weights via summation conditions.